Seen here in the summer of 1988, looking west toward the river, it's easy to see the major changes that have taken place. 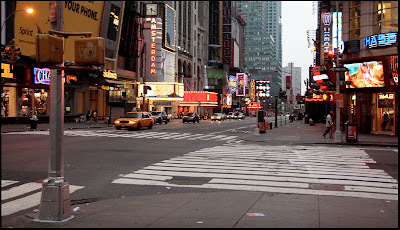 Both of the Seventh Avenue corners have had their buildings replaced: the southwest corner (on the left) had everything razed right up to the east wall of the New Amsterdam theater (see the article below - 41 Street Subway Entrance), while the northwest corner lost everything up to the New Victory theater. 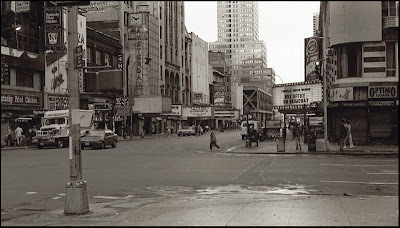 In '88 the New Victory was the marquee with 'Box Office on Broadway' on it; the marquee was removed in favor of a large double stairway during the renovations. Click on the picture to see the enlarged version; the stairway is the dark area below the 'Subway' sign. The northwest corner is now home to the 32 story Reuters building, aka 3 Times Square. Off in the distance you can clearly make out the Port Authority bus terminal on Eighth Avenue, with its 'X' girders, so appropriate for this neighborhood, and beyond that the 1932 art deco McGraw-Hill building, once the tallest in the area. These landmarks are less distinct in the 2007 scene; the PA's steelwork is covered with neon, and the 33 floor McGraw-Hill was surpassed in '04 by the 60-story Orion building, a residential tower. Back in 1988, people must have been crossing the street just any-which-way, even diagonally, I bet. Can't have the tourists doing that.